Danish shipping giant Maersk will become the first company to send a commercial container ship from the Pacific to the North Atlantic through Russia’s Northern Sea Route, sailing through the Arctic. The move underlines the impact of global warming on the Arctic ice caps. The Venta Maersk, an ice-class ship able to carry a cargo of 3,600-containers, is due to sail from Vladivostok bound to reach St Petersburg by late September, industry publication ‘High North News’ has reported. It will carry a cargo of frozen fish. Maersk confirmed the report. The so-called Northern Sea Route runs between the far north coast of Russia and the North Pole. It is only ever passable for a few months of the year, and, for now, ships require the expensive support of a nuclear ice-breaker and it is not viable for the biggest commercial container ships. But it can shave a week off travel times, and 2018 has been an unusually hot summer. If successful, opening a new commercial route would shorten sailing times between Europe and the Far East, potentially rivalling the Suez Canal for some goods. 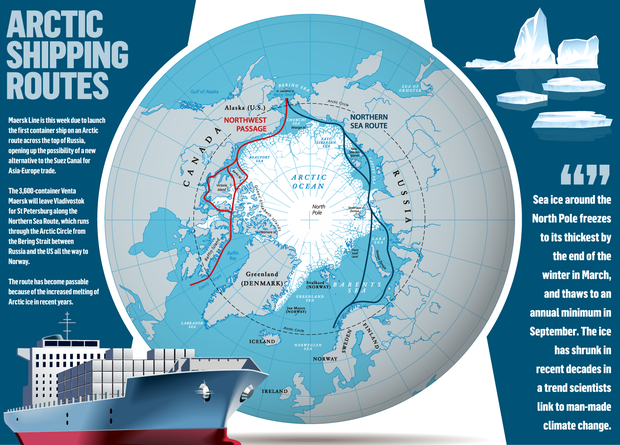 Shipping lanes across the frozen north of Canada – the North West Passage, linking ports on the east coast of the United States to the Pacific, are also seen as increasingly viable as the ice-caps retreat. Maersk CEO Soren Skou previously confirmed plans to sail Russia’s Northern Sea Route in an interview last year that followed a meeting with Russian officials in November. On July 23 this year, Russia issued the permit for the Venta Maersk’s East/West sailing between September 1 and 20. Sea ice around the North Pole freezes to its thickest by the end of the winter in March, and thaws to an annual minimum in September. The ice has shrunk in recent decades in a trend scientists link to man-made climate change. Maersk’s Chinese rival, China Ocean Shipping Company (COSCO), is also active in the region including making five transit voyages last year. The prospect of a regular container service sailing north of Russia remains some way off, experts say, but shipping companies are increasingly testing what they can do in the far north. Earlier this year, shipping company Teekay said one of its tankers loaded a first cargo of liquefied natural gas at a terminal in Arctic Russia and travelled to France in January – the first ship to make such a winter voyage without an icebreaker. Winter sea ice on the Arctic Ocean covered the second smallest area on record this year, the US National Snow and Ice Data Centre (NSIDC) said in March. The thaw that is opening the region to shipping and oil exploration may be disrupting weather far to the south, scientists said. The 2018 winter ice was about a million square kilometres – roughly the size of Egypt – below the long-term average maximum, NSIDC data show. Until now, the focus has been on a trend of shrinking Arctic sea ice in summer, which may also affect weather far to the south. Researchers suspect Arctic warmth can disrupt the high-altitude jet stream and send brief blasts of frigid air south – such as a ‘Beast from the East’.